grandma's cookie jar: Two - or Three Days of Fun - Giant, Frozen Marbles! Two - or Three Days of Fun - Giant, Frozen Marbles! Josiah is in kindergarten this year, so he will have two weeks off for Christmas break . . . of course this means two days of fun . . . or as Josiah is pulling for - three days of fun! This past summer we had four days of fun with Josiah and Caleb - they came to our house for four days and we had lots and lots and lots of fun! So this time, since swimming in the pool is definitely NOT on the list of fun things we are going to do, I am spending some time looking for fun things we can do! I do love Pinterest for the fun ideas I find on it! I thought I'd share with you some of the fun things we are going to do . . . in case you are planning some fun days of your own with your grandchildren over Christmas break! The first idea is . . . Giant, Frozen Marbles!!! All we have to do is, fill balloons with water and add food coloring; once frozen cut the balloons off, place around your yard and they look like giant marbles! What do you think? 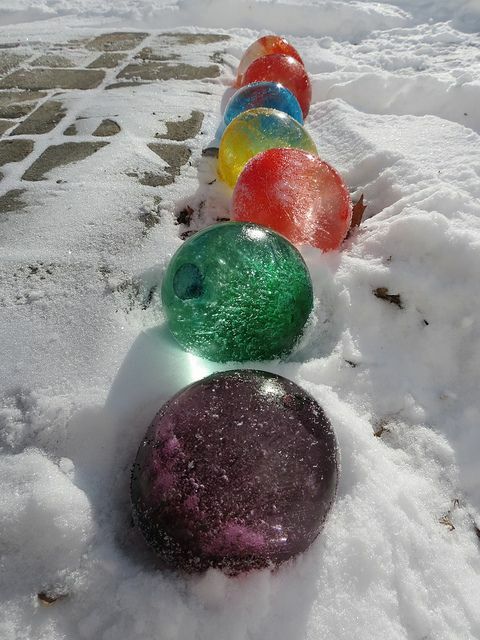 I can picture these "giant, frozen marbles" scattered around my yard! Maybe we will add a small toy so when we place the giant, frozen marbles, we can then keep an eye on them so when they melt the boys can go on a treasure hunt to find the items which were frozen inside! Hmmm . . . sounds like a great activity for additional days of fun in the Spring! Enjoy!